Toyota has announced the reveal of a new Toyota Furia Concept and gives us a glimpse of what could be a new future Toyota sport sedan. The Toyota Furia Concept will make its global debut at the 2013 North American International Auto Show next month and we get a glimpse of the car before its official reveal. The car looks like a sport sedan or possibly a sport coupe from the short video clip. 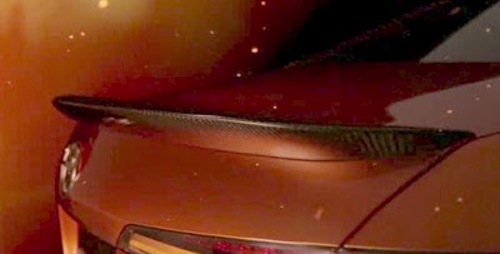 The car is shown with flames and appears to be in the fury of a fire storm. Furia is a Spanish word and when translated to English, it means fury or rage. It also means the violence or the fury of the storm. This would explain the firestorm that appears to engulf the Furia Concept in the video clip below. The red car can be seen with a mesh grille up front with wedge-shaped headlights. In the rear, the video clip shows a spoiler that runs the length of the rear deck and a short profile view of the concept car before going out of view. Toyota’s CEO Akio Toyoda, has been wanting to develop performance oriented cars and change the public's perception of the Japanese company since taking over a few years ago. The partnership with Subaru that developed the Toyota GT 86 /Scion FR-S was just the beginning of his long-range plan to change the culture at Toyota. Is the Toyota Furia Concept a future performance sport sedan? Toyota President Akio Toyoda, who is a professional racer said, "BMW's strength is in developing sports cars," said. "I am excited to think of the cars that will result from this relationship." Toyota has looked at the success of BMW, Mercedes-Benz and Audi and wants to have a sport sedan that would challenge the German automakers. This could be the forerunner of a performance sport sedan that Akio Toyoda has dreamed about. The new Toyota Furia Concept will be revealed in the Toyota display at Cobo Hall on Jan. 14, 2013 at 2:25 p.m. EST, with a presentation by Bill Fay, group vice president and general manager of the Toyota Division.